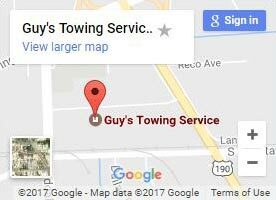 When you need to call on a dependable fleet of tow trucks,Guy’s Towing Service will be there at the sound of a dispatch. Any type of towing service you need in Port Allen, whether it’s a light-duty tow or an emergency winch out, our professionals will quickly answer your call and arrive to the scene with the right ammount of towing power for your vehicle or trailer. How long does it take from dispatch to arrival? ? As soon as we get the call, along with the whereabouts of your location and the size of your vehicle in need of towing, we dispatch our tow truck. Our large service area includes the greater metropolitan area surrounding Port Allen & Baton Rouge. Once we have all the details, we give you an ETA for our trucks to arrive. ! Accidents happen. And when they do, you’ll want a reliable towing service to upright your car, truck, RV, or trailer. That’s why our tow trucks come equipped to handle the toughest auto recovery situations imaginable. We use a 60-ton crane system for recovering overturned autos. We can even pull out vehicles submerged in water! This system is capable of free-lifting typical cars and trucks and setting them back on the street. 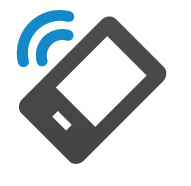 Then we can tow it back to your property with ease! We’re on call. 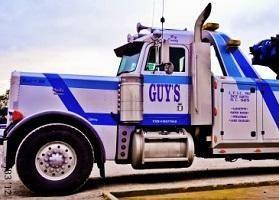 Our 24-hour tow truck service means we’re available all day, all night, any day. The same policy goes for our roadside assistance service. 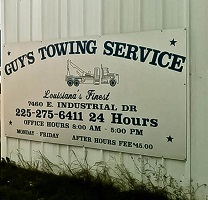 At Guy’s Towing, we try to reduce wait time and inconvenience as part of our customer service to you.